In the operation mode ‘Cooling the battery’ water is taken from the water reservoir and enters an evaporator. The sorption reactor is under low pressure and hence attracts vapour, yielding a pressure lower than the vapour pressure in the evaporator. This leads to further evaporation, the enthalpy of which is provided by heat at a low temperature level (e.g. 25°C) extracted from the battery, which is therefore cooled. 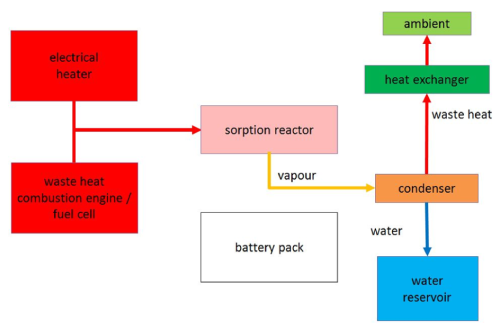 The sorption reactor releases the adsorption enthalpy at a high temperature level (e.g. 40°C) which is transported away and released to the ambient. The vapour circuit is closed with respect to the ambient and operates at low pressure around the vapour pressure of water at the given temperature levels, and the pressure corresponding to the water load of the sorption material in the sorption reactor, respectively. In the operation mode ‘Charging the thermal storage’ heat at a high temperature level (e.g. 90°C) is provided either by waste heat of a combustion engine or a fuel cell in a hybrid vehicle, or by an electrical heater when having a source of electricity other than the battery available (e.g. when charging the battery). The sorption reactor releases the vapour at a pressure higher than the vapour pressure present in the condenser. Therefore the vapour flows to the condenser and condenses. The condensation enthalpy released at moderate temperatures (e.g. 35°C) is transported away by a heat exchanger and released to the ambient. The water is conserved in the water reservoir for later use. 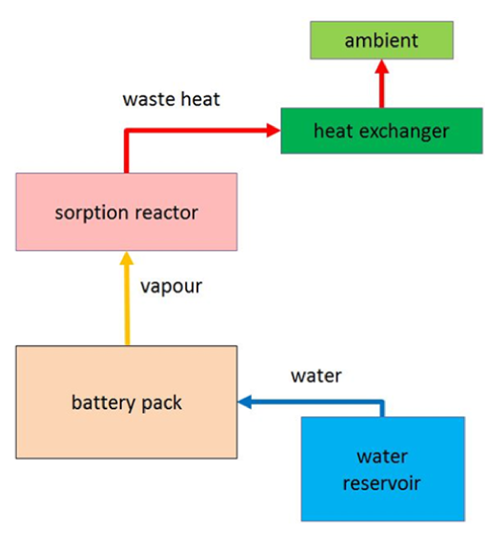 In the operation mode ‘Heating the battery’ the sorption process is qualitatively equivalent to the operation mode of cooling the battery. However, the evaporization enthalpy is taken from the ambient at a low temperature level, while the adsorption enthalpy is released to the battery at a higher temperature level.